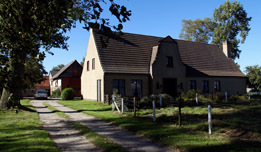 Hof ter langeleye planke is the place for farm holidays, situated in a quiet area amidst far-stretching coastal polders. 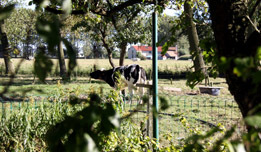 Hof ‘Ter langeleye planke’ is ideally located, in a quiet area, amidst the far-stretching coastal polders. There are two flats fitted to accommodate 6 persons. The estate is located on a working farm with beef cattle and arable land. 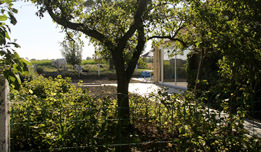 On Hof ‘Ter langeleye planke’ disposes of two houses with the necessary facilities for a holiday which accommodate 6 persons. Both houses have a spacious living room with a large dining room table, a sitting room, a TV set, the radio and free et Wi-Fi Internet connection. There is a fitted kitchen, a bathroom, WC and double bedroom on the ground floor. There are two bedrooms on the first floor, each accommodating 2 persons. A child’s bed is also available. Bed coverings are available and there are bed linens and towels are for rent. What you should take along with you?